Our Future Rooted in Our Past: Electric Scotland? I met someone in church today needing assistance in researching their family lines in Scotland. I have not posted a great deal about Scotland so I decided to see what I could find regarding the Scottish Genealogy websites. 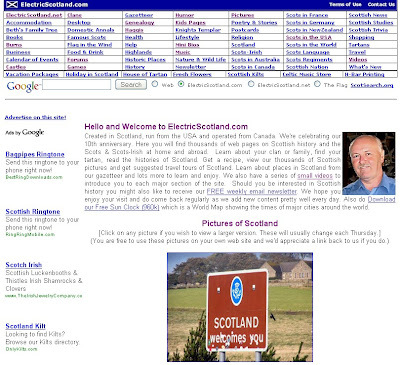 I came across this site "Electric Scotland" as a result of my search. According to the author of the site Alastair McIntyre, the site began with history of Scotland. The site continued to grow and is now providing information regarding the Scots that left Scotland. An extensive children's section provides information and entertainment for your children all the while they are learning about Scotland. This site has so many different areas to research that it is hard to narrow it down to just a few but I will tell you about a few of them. Historical Maps including clan maps, forums, historical clans and families, information on the Tartans of Scotland, and Scots in the US to name a few. Below is the introductory video that Alastair McIntyre has developed to help you navigate and learn about his site. I would suggest viewing this video prior to visiting his site. Note: This site has links to other Scottish websites, stores, and travel sites. If you would like to research this site, please click here.